Nothing strikes fear into a mom's heart like an all white outfit. Because, KIDS, y'all. Kids have an internal radar for anything pristine, and will basically find, seek, and destroy. They will use Cheeto fingers. They will use mud and/or dirt. They will use snot and boogers. They'll use things I haven't even considered yet, because THEY ARE TINY SAVAGES. Regardless. 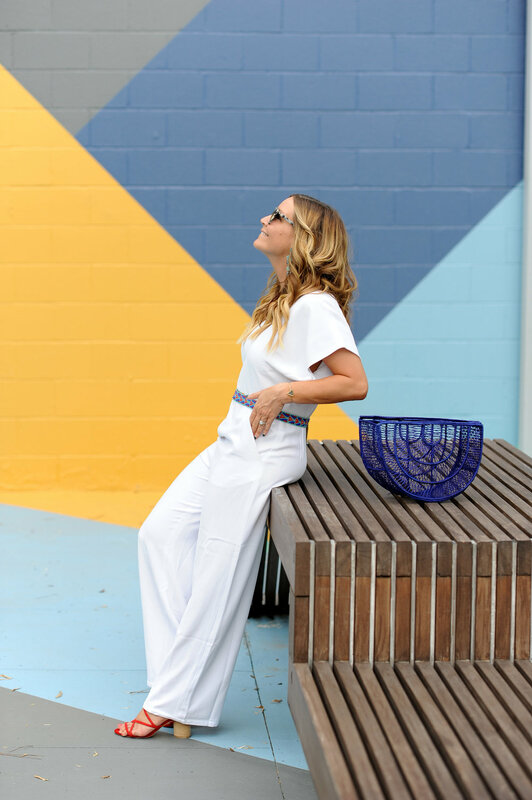 This white jumpsuit is completely worth the risk. Since I'm all about styling an item multiple ways, in order to make it free (NO), I wanted to share a few ideas for how to wear this bad boy. 1. Belt it to add some color/interest. This is what I did, and loved the way it added a fun little detail. 2. Accessorize with colorful shoes. Or fun earrings. Or double down and do both. 3. Throw on a fun kimono, so you can be all yeah, I AM a kimono loving, white jumpsuit wearing boss. People will know you aren't to be trifled with. 4. Layer a graphic tee, sweater, or t-shirt on top, which is probably my favorite hack in the world right now. There ya go. Your white jumpsuit is now free. Ish. You're welcome. P.S. I know I haven't been around much lately. A remote location (Alaska) and unreliable Wi-Fi have equated to a real twitchy and basically non-existent Sherri. A) I've missed y'all! And B) get ready to have an overabundance of posts because Nordstrom's ANNIVERSARY SALE . I hope everybody's been stretching their clicking fingers, and optimizing their sale strategies because it's about to GET REAL. Real spendy and real annoying. Anyway, I'm coming back at ya with a little pre-sale post tomorrow, plus I'm giving away two rather large Nordstrom gift cards. (And YOU get a gift card, and YOU get a gift card, and YOU get a....oh wait.) Make sure you're following me on Instagram so you can enter to win the chance to NOT give your significant other severe anxiety as he clearly doesn't understand how you are SAVING MONEY by shopping. AHEM.